Based on the well-received 2008 Icelandic film ReykjavÃ­k-Rotterdam (directed by and starring Baltasar Kormakur), Contraband (Universal) is a gritty, muscular crime thriller that continues Mark Wahlberg’s rich vein of form that includes The Departed and The Fighter. Chris Farraday (Wahlberg) is a retired criminal -who once represented one half of the so-called ‘Lennon & McCartney of smuggling’ -but opted to put his family first and give up running contraband before it landed him in jail, like his father. However, after his hapless brother-in-law Andy (Caleb Landry Jones, X-Men: First Class) botches a drug deal for his demented boss Tim Briggs (Giovanni Ribisi, Boiler Room), Chris is forced to step into the fray and settle Andy’s debt himself. Aided by ex-smuggling partner Sebastian (Ben Foster, The Mechanic) Chris reassembles his old crew and wrangles his way onto a ship heading to Panama, much to the disgust of its captain, (JK Simmons, Oz). Inevitably, nothing goes as planned, and when the counterfeit US dollars he has been promised turn out to be too shoddy to use, Chris is forced to do business with the psychotic Gonzalo (Diego Luna, Y Tu Mama Tambien). Allowing Baltasar Kormakur to helm the remake of his own foreign-language film is a novel touch, and the Icelandic filmmaker is certainly able to get under the skin of the storyline. Elsewhere, the increasingly dependable Wahlberg makes for a plausible hero in a role which seems to fit him as snugly as a knuckle-duster! While Contraband may not reinvent the crime movie, its blend of tension, violence and grittiness makes for an enjoyably brutal cocktail. However, what sets it apart from similar material is its top-notch supporting cast, not least the creepy, psychotic Ribisi, who delivers the movie’s most memorable performance, and has rarely been better. All in all, Contraband is a superior action thriller that follows in the blood-stained footsteps of Ben Affleck’s similarly impressive The Town. Bruce Lee’s status as an action movie icon is pretty much unrivalled, even if it is essentially based on just five films (The Big Boss, Fist of Fury, The Way of the Dragon, Enter the Dragon and Game of Death). However, it is his influence as a fighter that may yet overshadow his unfortunately brief movie career. 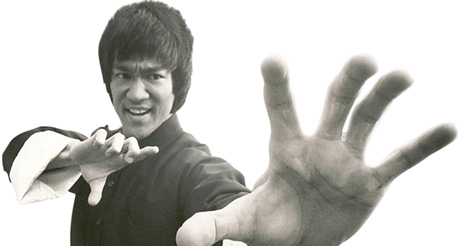 New documentary I Am Bruce Lee (Fremantle Media) seeks to explore the man, the myth and the movies, with an appealing blend of rare archive footage, film clips and enlightening interviews with his family and friends. Despite his sudden death at the age of 32, Lee managed to cram an almost super-human amount into his short life, and this film endeavours to outline his main achievements, whilst probing his influence in less well-known spheres, such as among black cinema audiences. Although some of the interviewees seem slightly bizarre (step forward Taboo from the Black Eyed Peas! ), they are generally well-selected and Lee’s widow Linda Lee Cadwell is a particularly illuminating presence. Although the inclusion of a number of mixed martial arts (MMA)/Ultimate Fighting Championship (UFC) personalities initially appears dangerously vogue-ish, it makes sense in the grand scheme of things, with the documentary effectively positioning Lee as the modern-day father of MMA, a viewpoint which pleases and aggravates fight fans in equal measure. Crammed with fascinating rare footage and revealing insights into Lee’s struggle for acceptance in Hollywood, where he was sidelined in thankless supporting roles, despite his growing influence as a fight choreographer and trainer to the stars. (He trained the likes of James Coburn and Steve McQueen, both of whom later acted as pallbearers at Lee’s funeral, alongside Chuck Norris and George Lazenby). I Am Bruce Lee is a compelling documentary, rich in detail, and will definitely have you reaching for your copy of Enter The Dragon as soon as you have finished watching! Bringing up the rear this week is Hijacked (Anchor Bay), a testosterone-soaked B-movie thriller starring former UFC heavyweight champion Randy Couture as Paul Ross, a hardboiled US government agent who is on the trail of a global crime syndicate known as The Tribe. When a confidential tip-off ends up in a blood-bath, Ross’s determination to take down the terrorist cell increases even further, and a surprise clue suggests that The Tribe’s next target is brash British industrialist Bruce Lieb (Craig Fairbrass, Eastenders). With no choice but to hitch a ride on Lieb’s improbably huge luxury jumbo jet, Ross settles in for the long haul, only to see the plane promptly hijacked mid-air. Backed by Lieb’s hulking ex-special forces bodyguard Otto Southwell (Dominic Purcell, Prison Break), Ross aims to deliver a high-altitude beat-down and finally unravel the international conspiracy that has plagued him for months. Despite its gloriously silly premise and appealingly bloke-ish B-movie cast (fleshed out by Vinnie Jones in an absurd cameo as a suave James Bond-esque spy! ), Hijacked ultimately comes across like a well-intentioned mess. Ex-MMA stars are following wrestlers into Hollywood at an alarming rate (witness Gina Carano in Steven Soderbergh’s recent Haywire), but somewhat inevitably they lack the built-in theatricality of their WWE counterparts. Couture is no exception, and although he doesn’t disgrace himself, he delivers a pretty stodgy performance when not participating in one of the bizarrely infrequent fight scenes. That said, Hijacked could have possibly succeeded with a less inept script and a more claustrophobic setting -the luxury jumbo jet upon which the film unfolds is bigger than some hotels I’ve stayed in. Further, the airborne thriller aspect is a strangely mid-90s movie trope, and feels positively tacked-on here. Indeed the final scene -in which Couture and Purcell are poised to bust heads and take names in an unspecified tropical location -suggests a far more satisfying movie lurked underneath. File under: formulaic straight-to-DVD nonsense.